Karma Highway Wide Leg White Cotton Drawstring Pants one size fits all from size 2 - size 10. 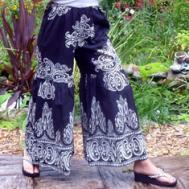 Karma Highway Black Cotton Drawstring Palazzo Pants - One Size Fits All, fitting women's sizes 2 - 10. Perfect for the beach, for dinner, for the movies, for dressy events! Simply any occasion!